Some years ago when I coached at Barstow HS, the head coach, a former Nebraska Nose Tackle by the name of Dionicio Monarrez, would like us to install some kind of trick play into our offensive game plan each week. He liked to surprise our opponents at key times during a game. He called the trick plays: “momentum changers”. One week our opponent was Cajon HS and while breaking down film of them, I saw that they favored a Cover 1 defense in short yardage situations and I wondered what the Free Safety would do if we went empty from a 2×2 formation by motioning our single setback out of the backfield (below). Would he stay in the middle of the field or would he pick up the RB? Cajon Special as the play would be called was a simple deception. The deception was that the inside receiver to the left side was actually an offensive Tackle while our Tight End replaced him on the right side of the offensive line. The OT was positioned on the LOS, so he was covered by the X-receiver and was not an eligible receiver. We see a lot of Cover 2 pass defense at our level. 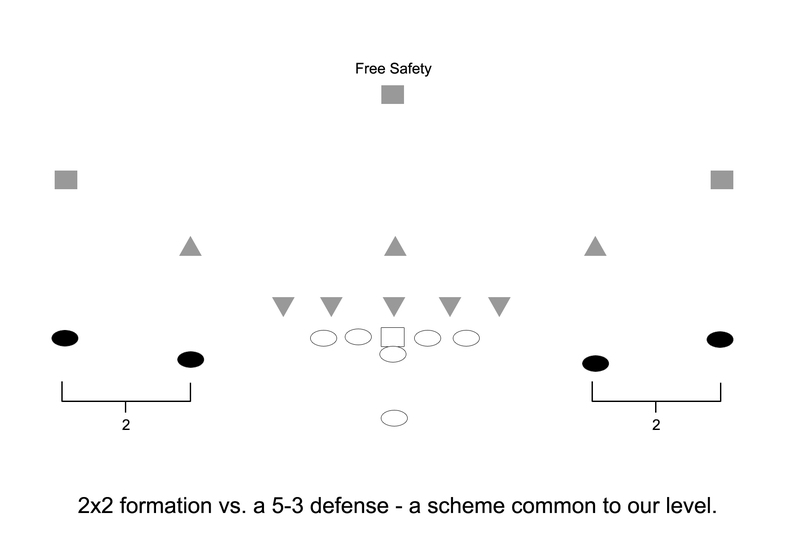 One pass play or “concept” that exploits the flat defender is the “Smash” scheme diagrammed below. It is a classic Cover 2 beater and is in the playbook of every high school or college OC with a penchant for throwing the ball. Smash Concept to the slot or TE side of a formation. Smash is a 2-receiver, hi-lo combination scheme that has the outside receiver running a 6-yd hitch and the inside receiver executing a 12-yd corner route on top. 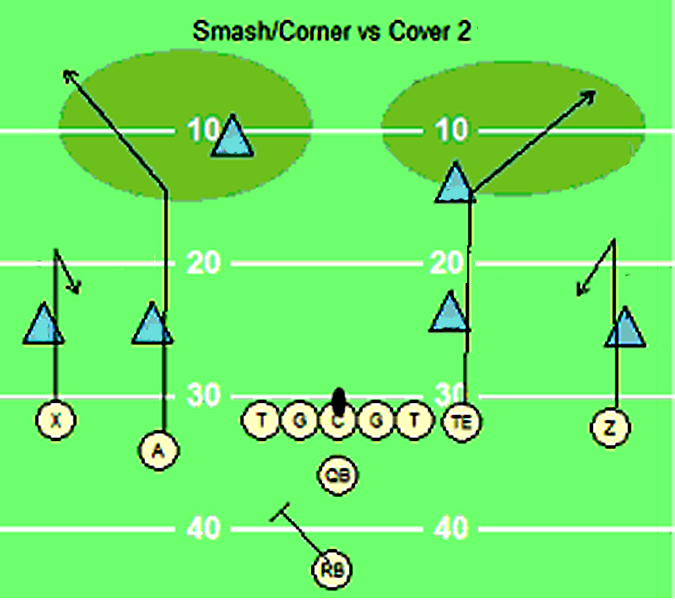 The idea is to put the CB or the flat defender to the 2-receiver side in conflict. If he sinks to cover the Corner Route, the Hitch is open. But if he sits to cover the Hitch, then the Corner is open. He’s the defender the QB reads to determine where to go with the ball. The play does more than attack a Cover 2 zone however. Versus man coverage, the corner route is a very good option — so long as the QB lays the ball to the receiver’s outside shoulder. The reason for this is because many defenses that play man coverage use inside leverage to take away the quick slant passes that can gash them for big yards and are easy throws. The fact that it is the inside receiver rather than the outside one who runs the Corner route can create some favorable mismatches for the offense. Most defenses put their CBs in man coverage on the outside receiver, while the inside receiver is then covered by either a Safety or a Linebacker. At our level, it is usually a bumped LB. Knowing the rules and how to manipulate them is often an aid to coaches as the diagram below will illustrate. It’s from the Houston Oilers’ playbook in 1993, the one season Buddy Ryan spent as the team’s defensive coordinator. It depicts a special goal-line formation Ryan designed for the end of the half or the end of the game—situations in which there were “less than 15 seconds” according to Ryan. 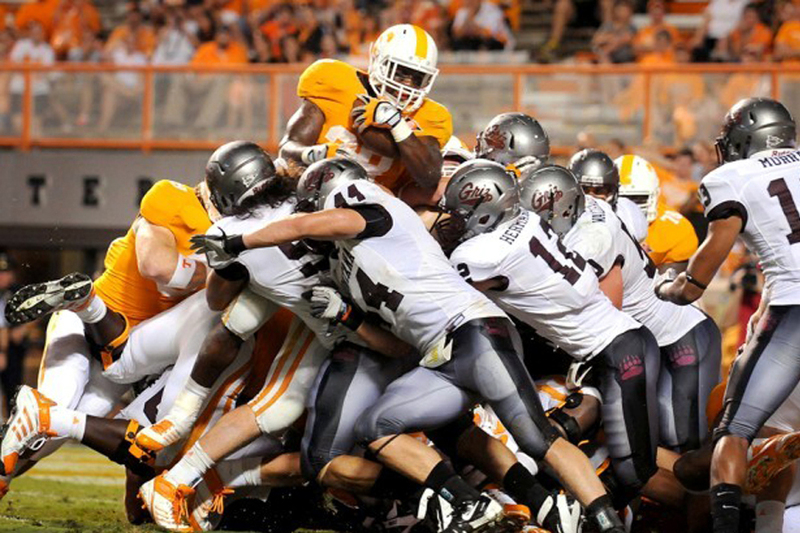 You’ll notice that there are 14 defenders. The idea is to allow the offense to run a free play, which more than 11 defenders would presumably be able to stop, with the understanding that a penalty has to be taken. The purpose is to force precious seconds to waste away, leaving the offense with less time to maneuver. The wonder is why Ryan stopped at 14 players. The Polish Goal Line defense was followed up by Ryan’s “Polish Punt Team” which he introduced to football lore while coaching the Philadelphia Eagles. In a most unusual formation, the Polish Punt Team was designed to prevent a blocked kick or a long runback. In it, Ryan sent 14 men onto the field for a crucial last-minute punt. At the worst, the expected penalty for too many men on the field would set the Eagles back 5 yards but drain precious seconds from the clock. To the surprise of the Eagles, no flag was thrown and the safest punt in NFL history was executed without mishap. Was Ryan sheepish about employing such a questionable tactic? Hardly. When asked during the taping of his weekly television show about the propriety of having 14 men on the field, Ryan did note a flaw in the strategy. “There should have been 15,” he snapped. First we want the WR to drive hard at the DB and make him think he’s going deep. “Sell the nine” we tell our wide outs. We want the DB to start his backpedal which will allow the WR to get proper positioning.